A corruption sandbox game about a college freshman on her first day of school. I say “sandbox” because I want the game to be fairly open. Story routes are going to be linear to keep things simple, but the activities Valentina does on a day to day basis will mostly be up to you. 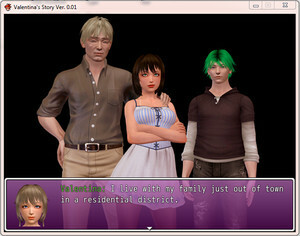 Currently the game contains the beginnings of two main story routes. Sam’s is easy to access. Zach’s is a little harder to find. – Change a bit on stripclub Dance, but still just have one day of work! -Change some musics of the game! – Now we can see police cars and a taxi animations. I try put it just for fun! So there still a lot more to do with this game! When i have more time i will try to improve the imgs of game! It’s possible the existence of bugs since i didn’t had time to test it! Please let me now what you find! Even with all the things, i still hope you like it!